The handsome new Acura RDX SUV is all set to hit the showrooms from June 1, bearing a base price tag of $37,300. The basic model is good for those who only want the cool looks of this car. Those who also fancy high-end technology features will have to pay $47,400. Mind you there is a $995 destination charge to be added to each of the prices quoted here. So yes, 2019 Acura RDX is a pricey car. But then again, it is also a lot of car. The RDX is by fat and away the nicest looking choice in its price bracket. It also benefits from really nice technology features. Some of the highlights include AcuraWatch safety and driver-assistive tecnhnology, an ultra-wide panoramic moonroof, next-generation Acura JewelEye LED headlights and the new True Touchpad Interface. Acura RDX can also be specified with the unique A-Spec trim package. The main features of this one include 20-inch wheels and low-profile 245/45R20 tires, gloss black exterior accents, large-diameter exhaust finishers, A-Spec badging and exclusive interior upgrades wiht red or black leather and ultrasuede. Available optional packages include Advance and Technology, And what you can find in those lists include 16-way power adjustable heated and ventilated front seats, a 10.5-inch full-color Head-Up Display, 16-channel Acura ELS Studio 3D premium audio, Surround View Camera System, Cross Traffic Monitor and blind spot information System. 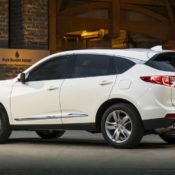 All 2019 RDX models are powered by the same 2.0-liter VTEC turbo engine mated to a 10-speed automatic transmission and available with Super Handling All-Wheel Drive. The unit is rated at 270 horsepower and 280 lb.-ft. of torque. 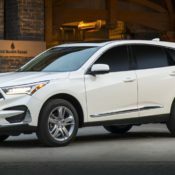 The post 2019 Acura RDX Priced from $37,300 – MSRP and Specs appeared first on Motorward.